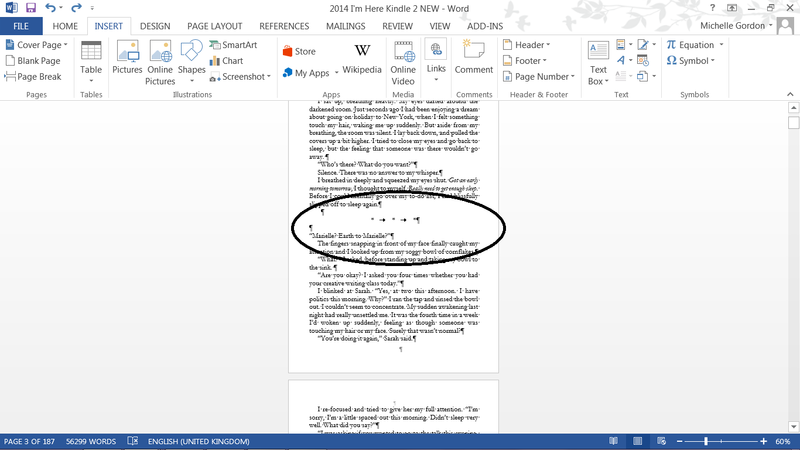 This post follows on from Formatting for Kindle – Part 2. Part 1 is here. 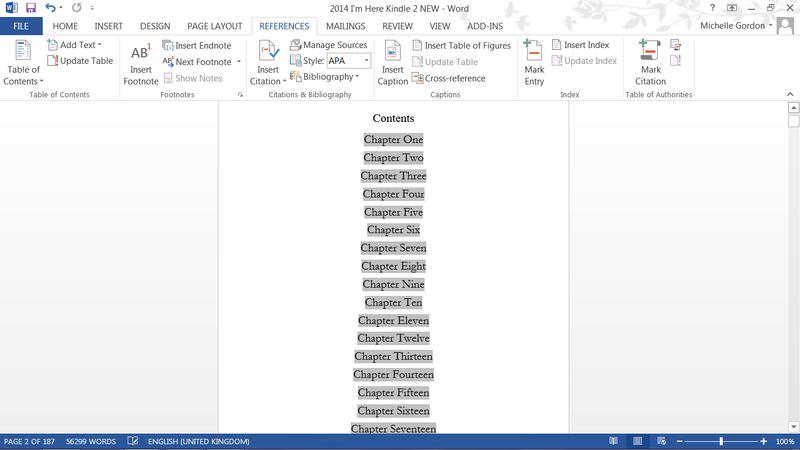 Go through the whole manuscript, highlighting the chapter headings and just clicking on the Heading 1 style. 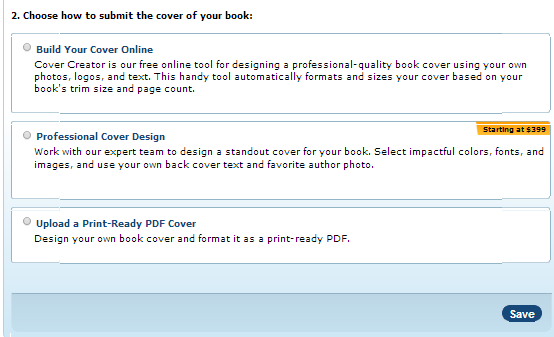 When you have done them all, if you click on Find, then Headings, you will see the list of chapter headings underneath. It’s useful to check through and make sure you haven’t missed any out. 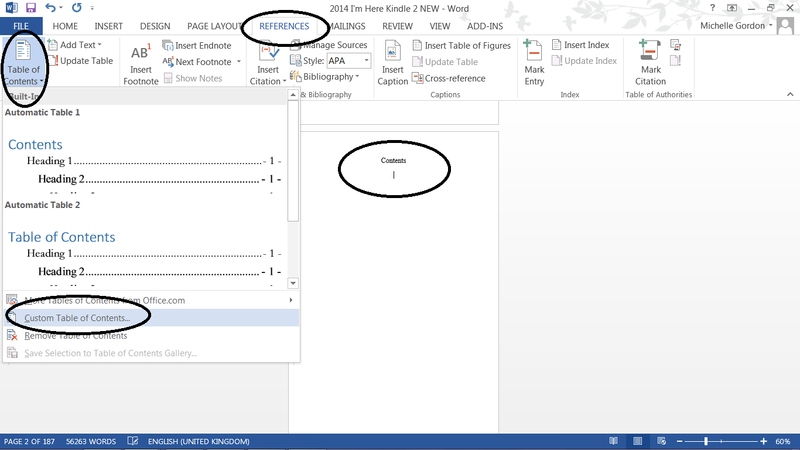 The next step of creating the table of contents, is to click on the page where you want it to go, (usually the second page) give it a title, like Contents, place the cursor underneath, then go to the References tab, choose Table of Contents, then Custom Table of Contents. A box will pop up, and here, you can change the font and size of the typeface in the table of contents, by clicking on ‘Modify’. 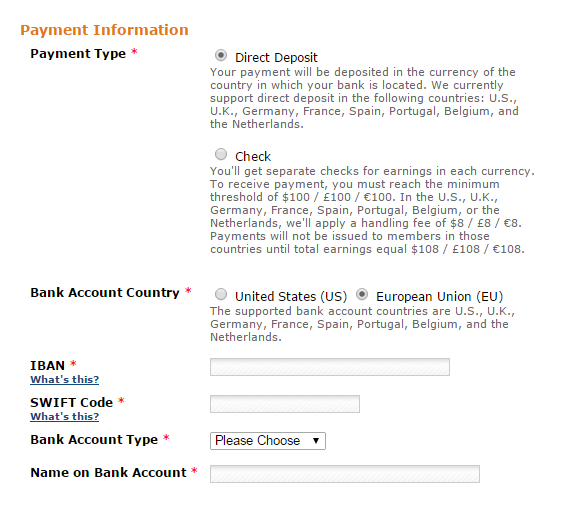 This box will pop up, where you can adjust the font type and size. Then you will click okay and be redirected to the above box again, where you want to deselect the Show Page Numbers box, make sure the Use Hyperlinks instead of page numbers is selected, change the Show Levels to ‘1’ and then click ‘OK‘. Congratulations! 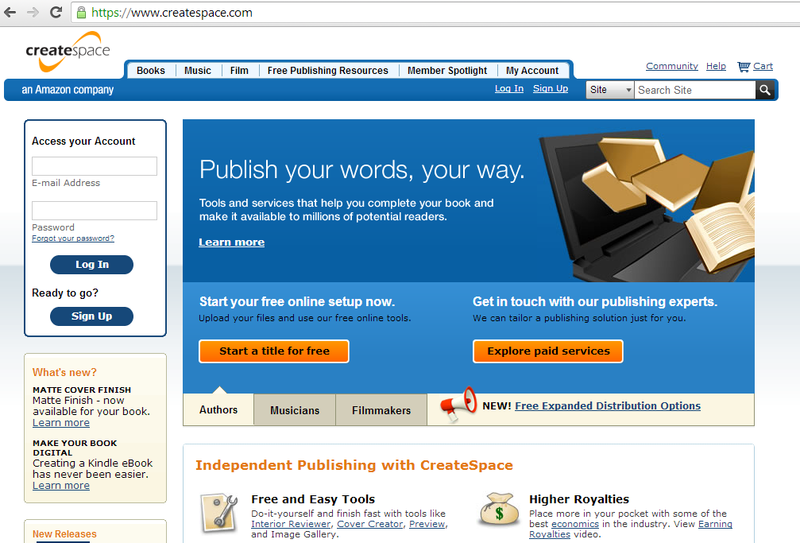 You now have a clickable table of contents! 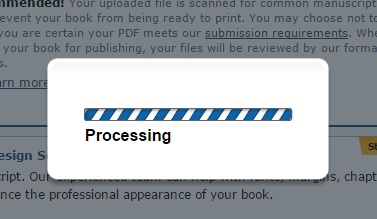 When someone buys your book on Kindle, they will now be able to skip straight to the chapter they wish to go to. 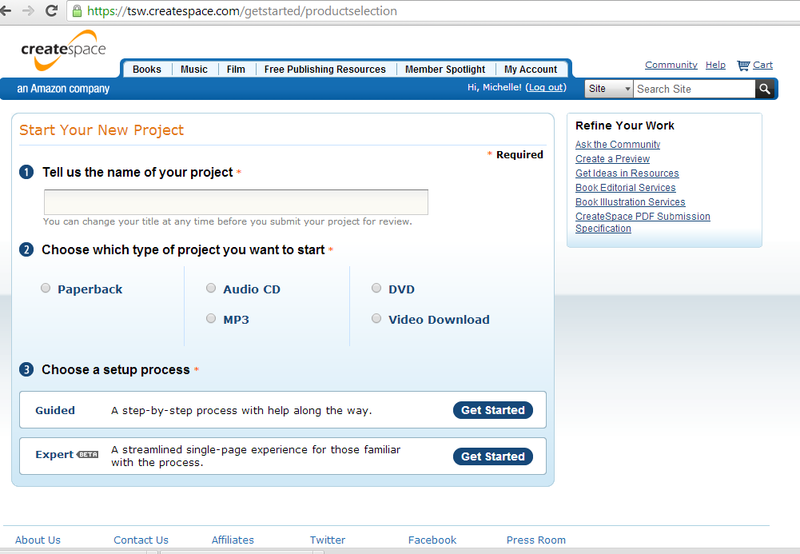 In the very beginning, I never had clickable contents, I didn’t see the point. 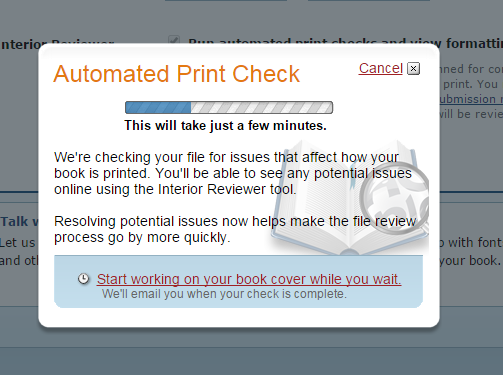 But now, being an avid Kindle user, when a book doesn’t have one, I get quite annoyed! 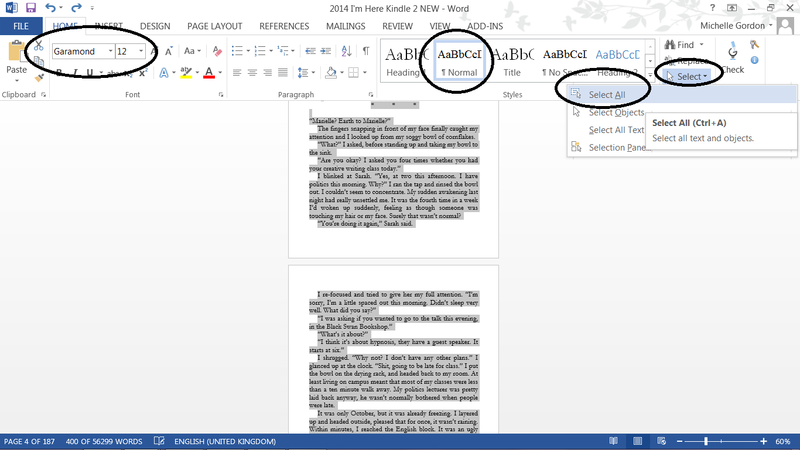 This post follows on from Formatting for Kindle – Part 1. 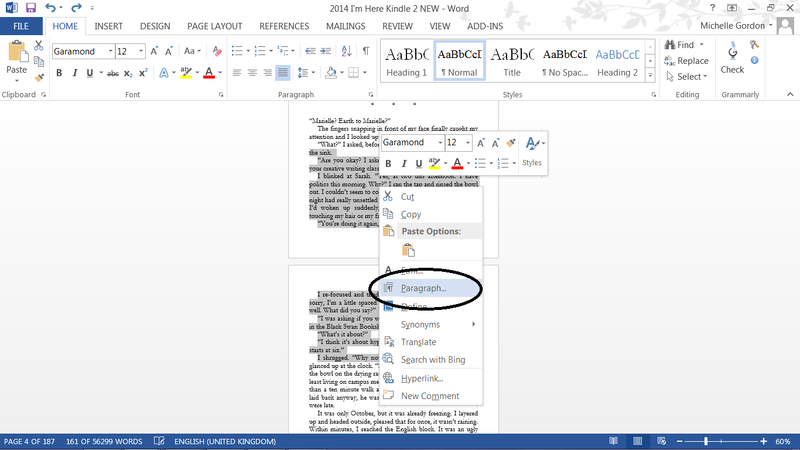 It details the next steps in the formatting process using Microsoft Word. 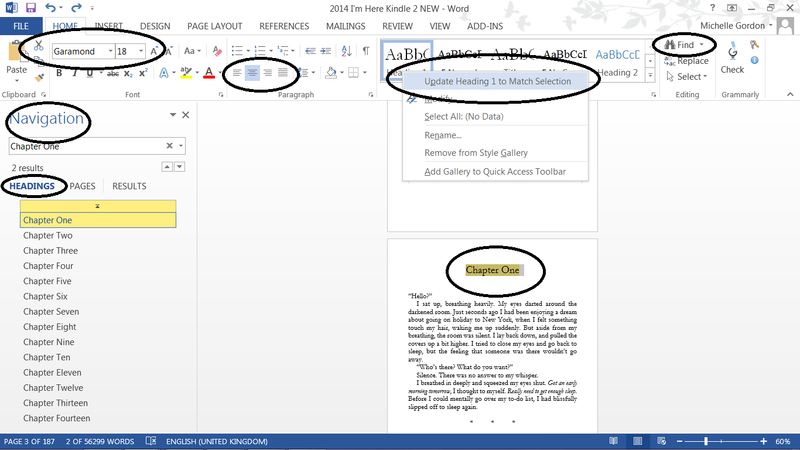 If you are formatting the book file from scratch, you want to make sure that there a page breaks inserted between chapters. 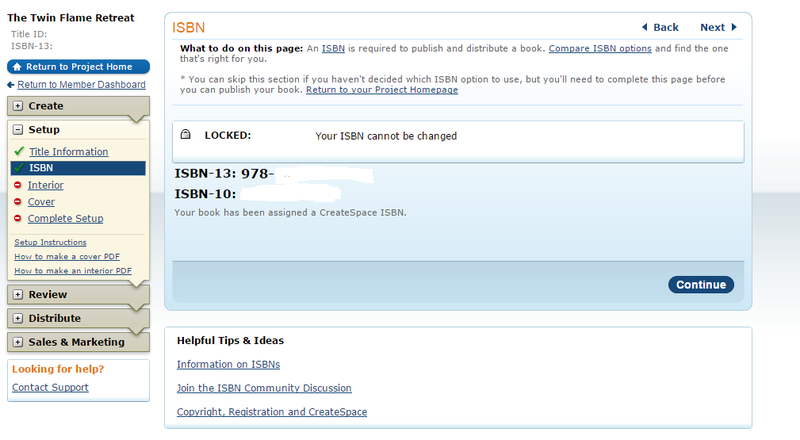 Please do not use the enter/return button to move the chapter onto the next page. 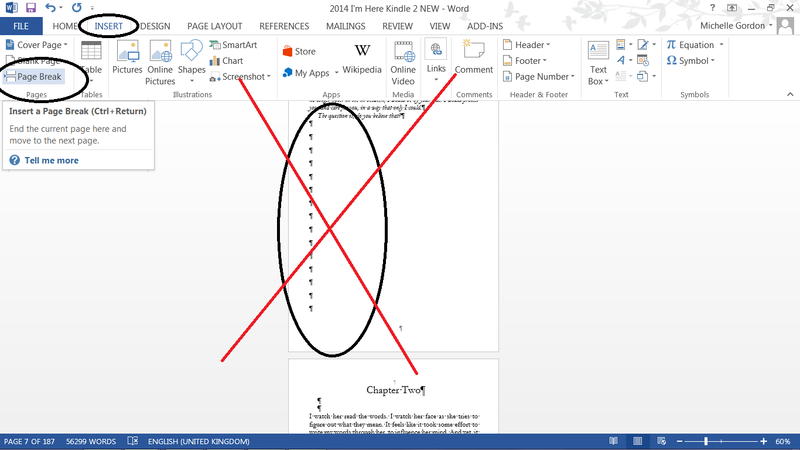 To reveal the formatting in your document, under the Home tab, you can click on the backwards P symbol, and it will reveal all the unseen formatting. 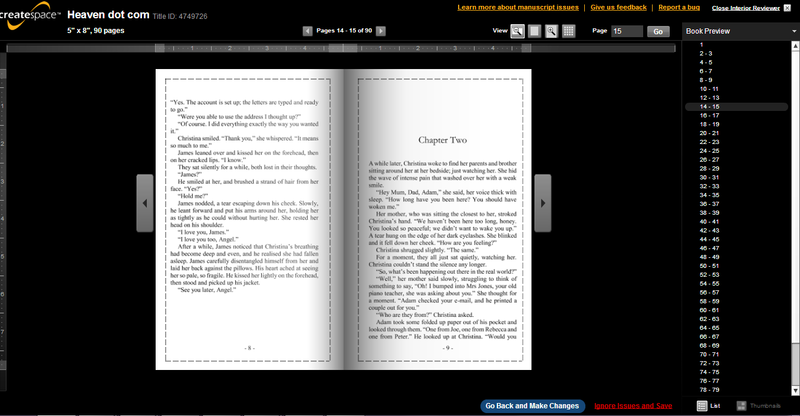 This image shows that a Page Break is separating the chapters. 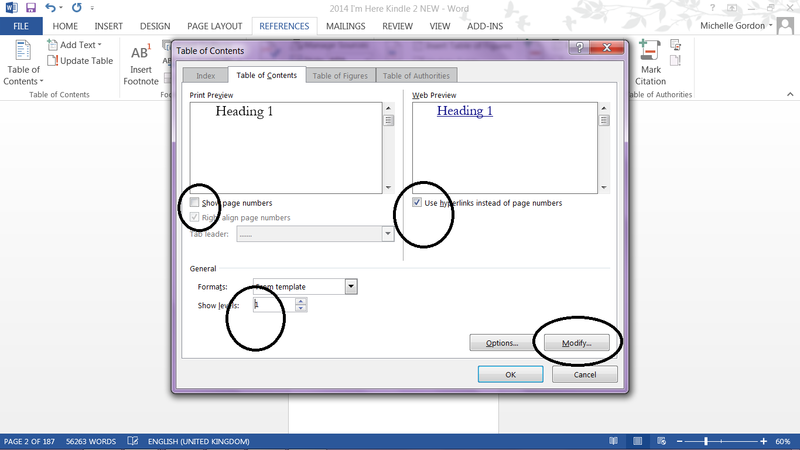 This image shows where to find page breaks – under the Insert tab, then Page Break. 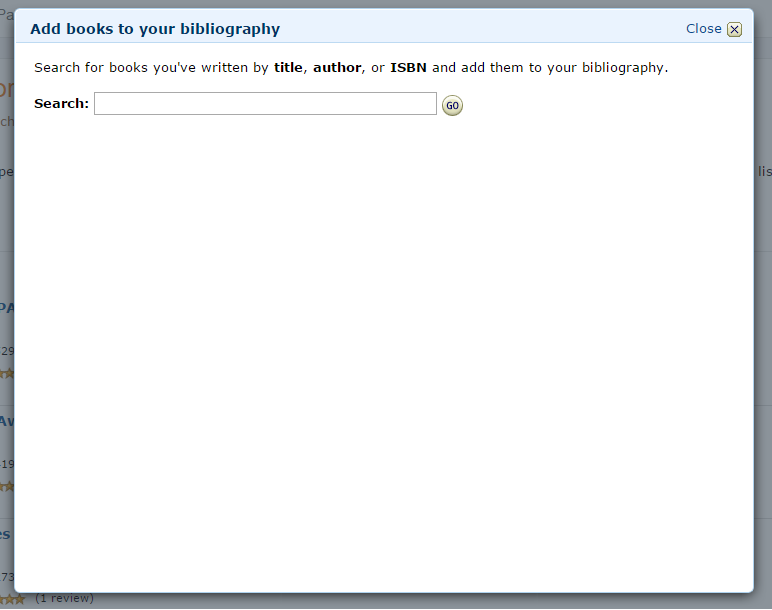 And it also shows what it looks like to use the enter/return key to separate the chapters. If you have done this, delete them and use the page breaks instead. 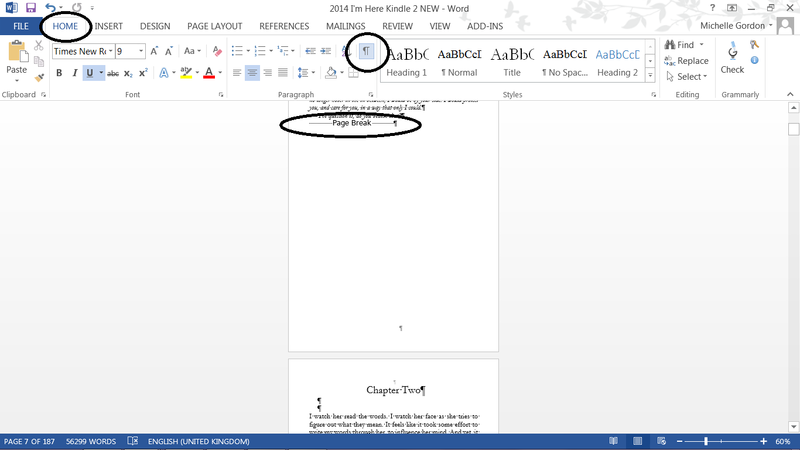 In my novels I like to break up sections of the story with three asterisks, with a tab space inbetween, and centralised on the page. You could just leave a space or use one asterisk. It’s up to you, but make sure it is obvious that there is a shift in the story at that point. 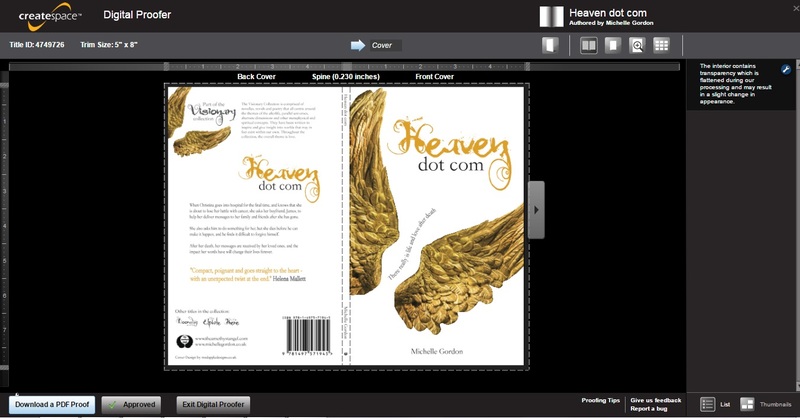 It is possible to change the font on some Kindle readers from serif to sans-serif, so because I prefer serif fonts, I always format my books to Times New Roman or Garamond. I use 12pt usually, again, eReaders can change the font size if needed too. 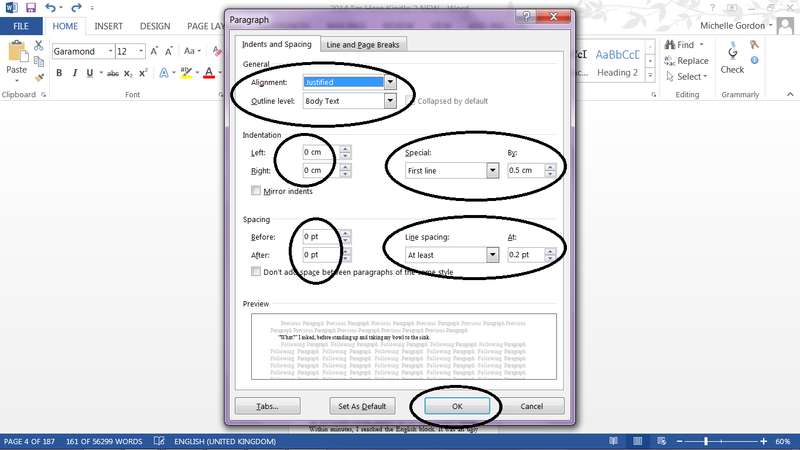 Easiest way to change the font and size, is to hit Select then Select All, and then change the type and size. When we get to creating the table of contents, we will change the chapter headings so they are a bit bigger at that point. 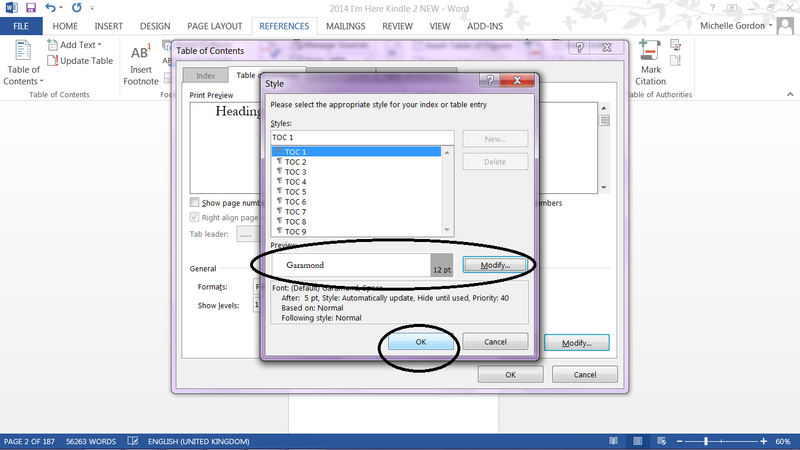 If, after changing the font type and size, you right-click on the ‘Normal’ style type, and click Modify Normal to Match Selection, then any normal text will automatically for that font style. The next part is all about indents, justification and line spacing. 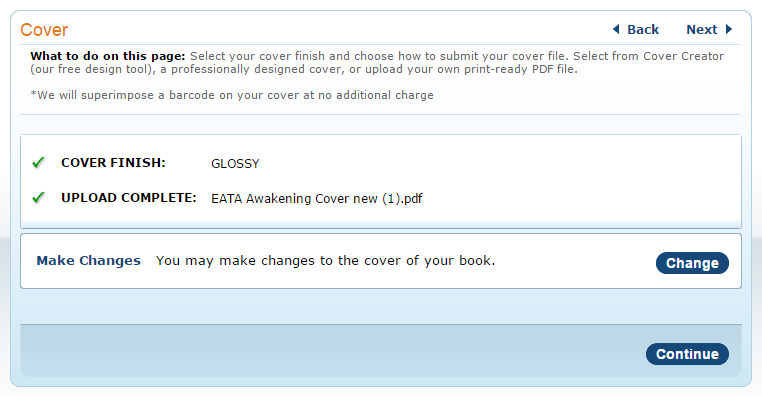 For this, you can just select some of your text, then right-click on the highlighted text, and choose ‘Paragraph‘ from the menu. You should never use the TAB key to create indents in your text, you should always insert indents in the Paragraph tool, as you can see below. If you have used indents, please remove them. 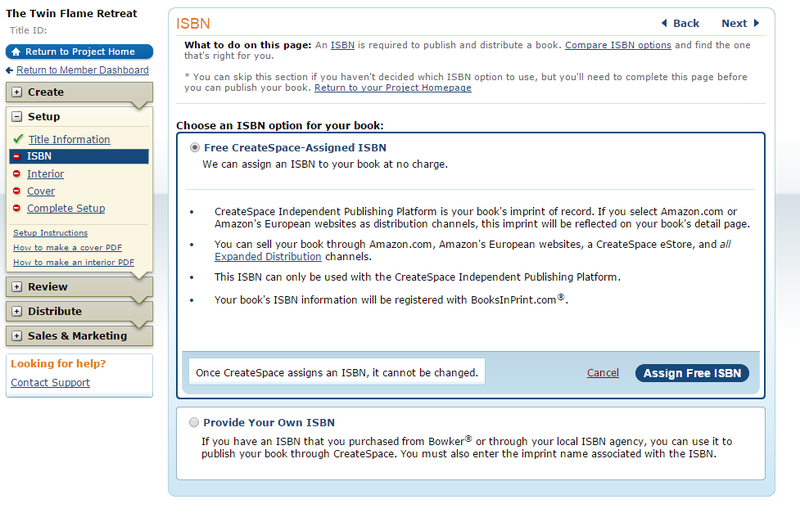 You can see my settings below for my book I’m Here. Tune in for part 3 tomorrow. 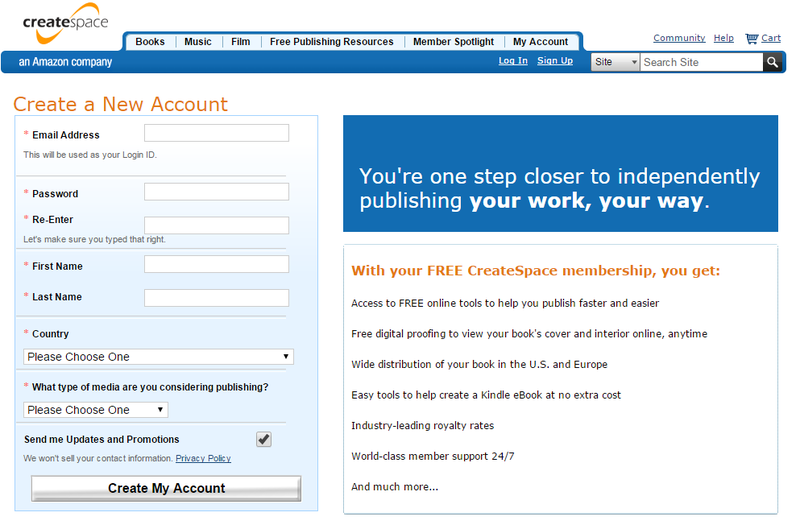 To follow on from the six-part series (part 1 here) I have posted on how to publish your book on Kindle, this post will detail the first steps of how to format your book for uploading to Kindle. 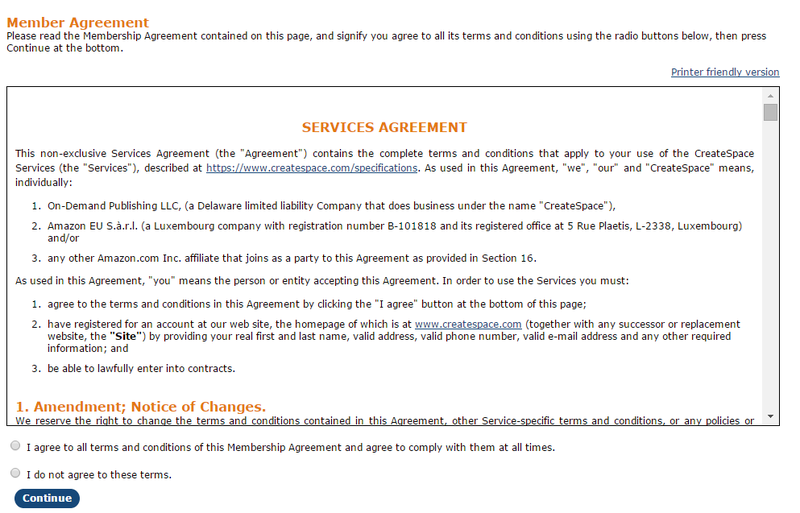 The next steps will be posted in the next couple of days. 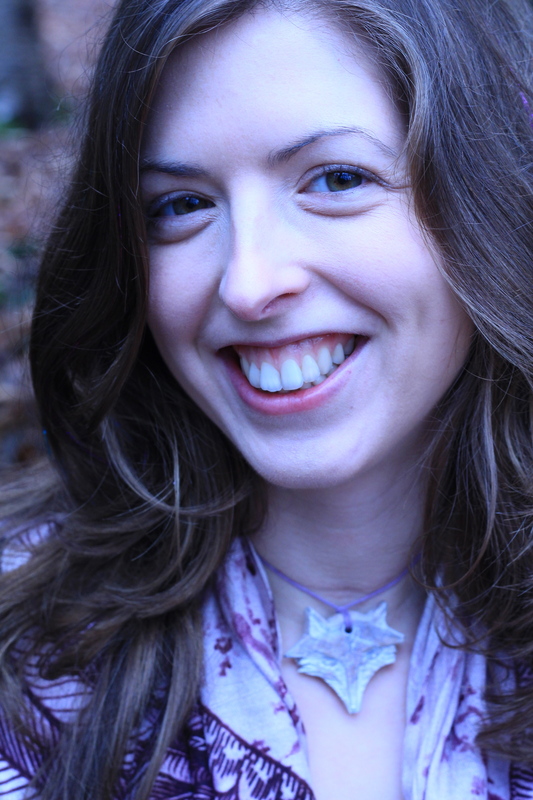 I know there are many programmes out there that do formatting for Kindle, and that there are many services on offer to do it for you, but if you have a fairly straightforward book (eg. 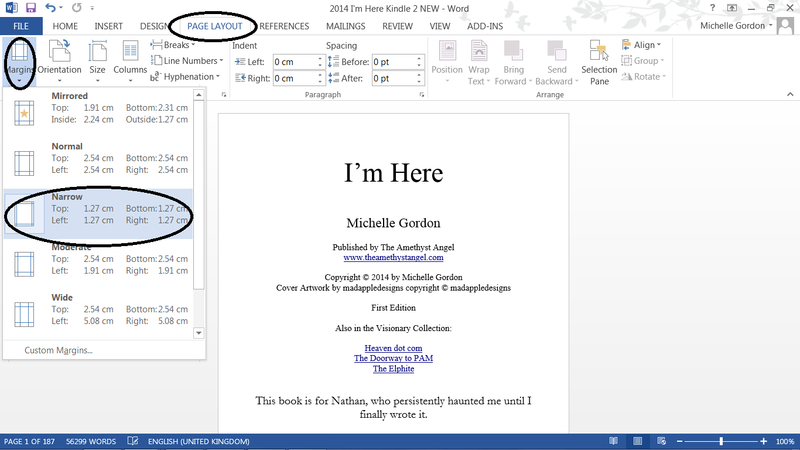 fiction novel that has no illustrations) and you have a decent knowledge of how to use Microsoft Word, (I use Microsoft Word 2013) then there is absolutely no reason why you cannot format your book yourself. It will take a bit of time, and it can be a little bit tedious, but it is completely doable. 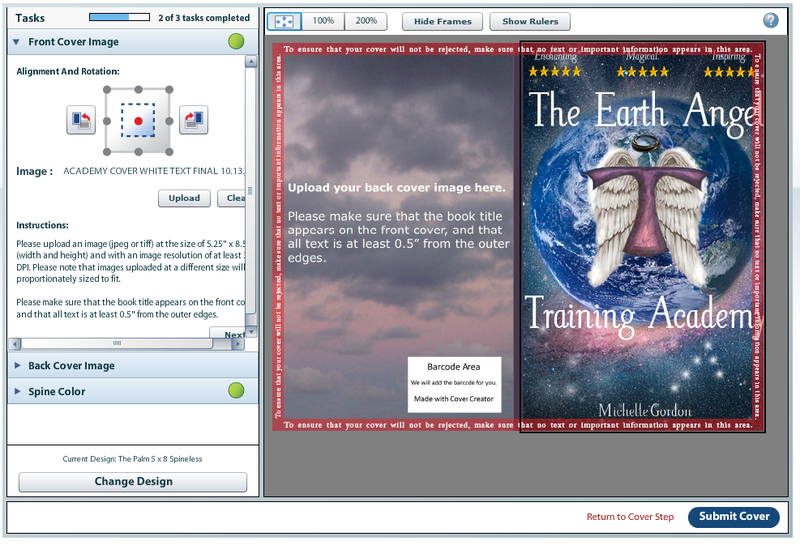 I have formatted all of my own books using the following method. 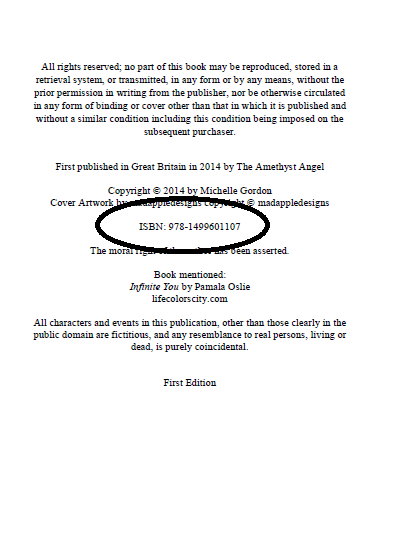 Though eBooks don’t need to have a certain page size, I usually set the page size to the same as the print version, because Amazon tend to give an approximation of the number of pages, so if you have A4 sized pages, then it’s going to appear to be a much shorter book than it actually is. 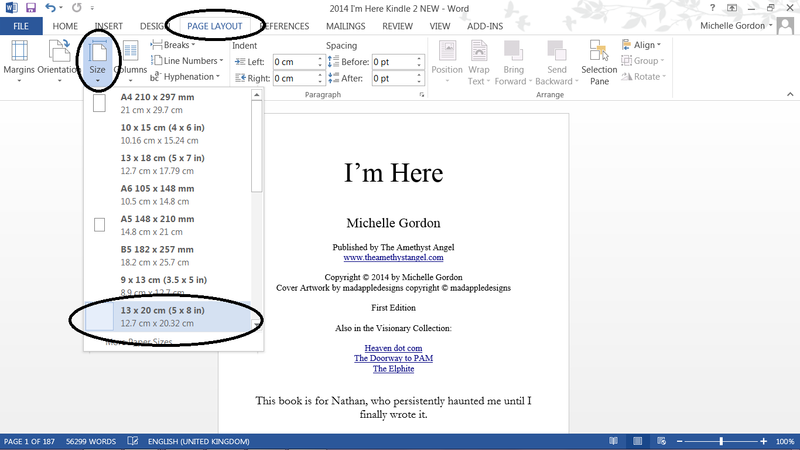 In Microsoft Word, you set the page size here from the Page Layout tab, then choose Size. 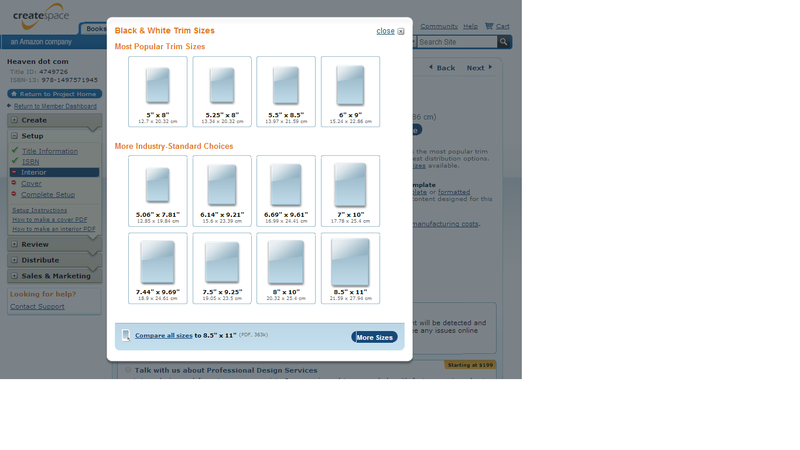 It doesn’t matter what you set the margins to for eBooks, so I generally just set them as narrow. 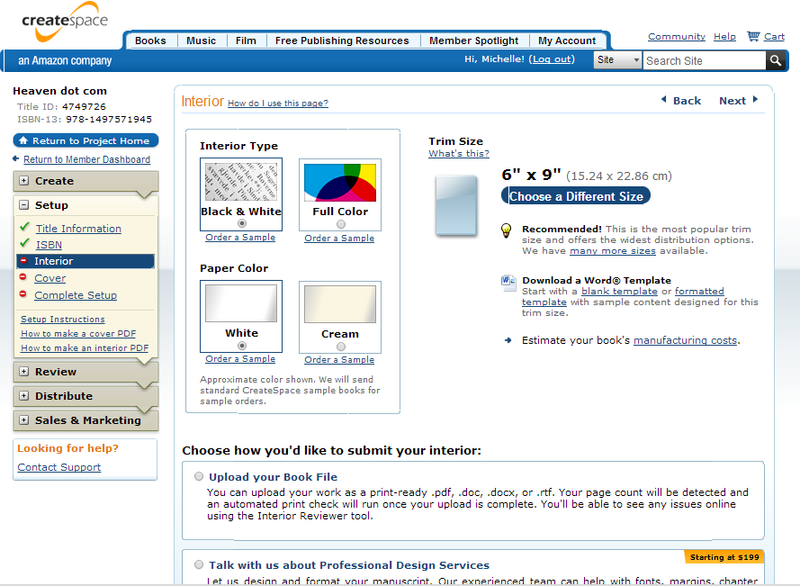 You can find margins under the Page Layout tab, then Margins, then choose which one you want. 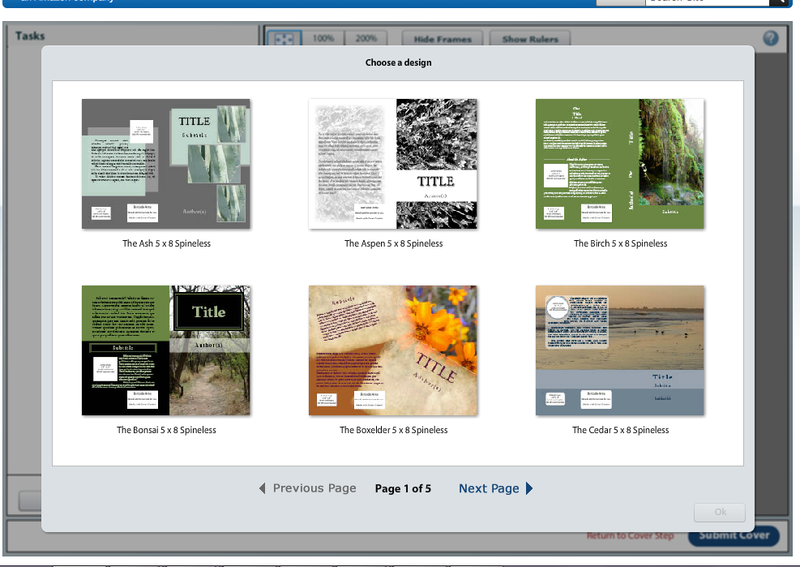 If you are formatting the book for Kindle using a file that was prepared for print, you may have headers and footers and page numbers. These all need to go. 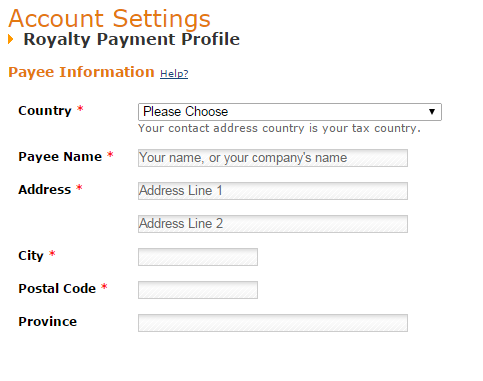 You do not want text in the header or footer, so delete it. 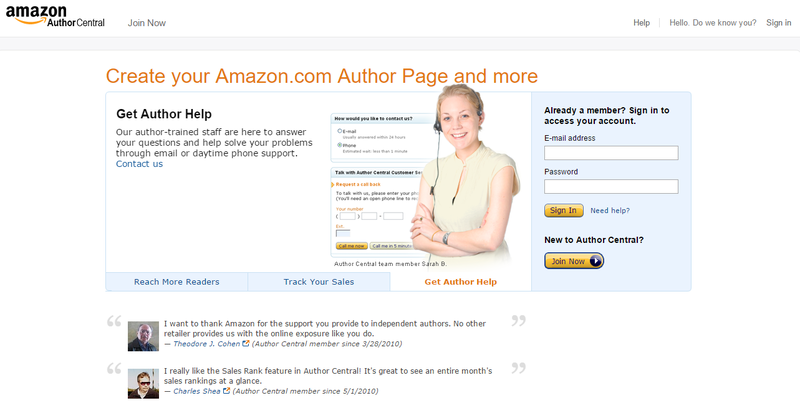 You don’t need page numbers in Kindle books because the text is reflowable to suit any device. 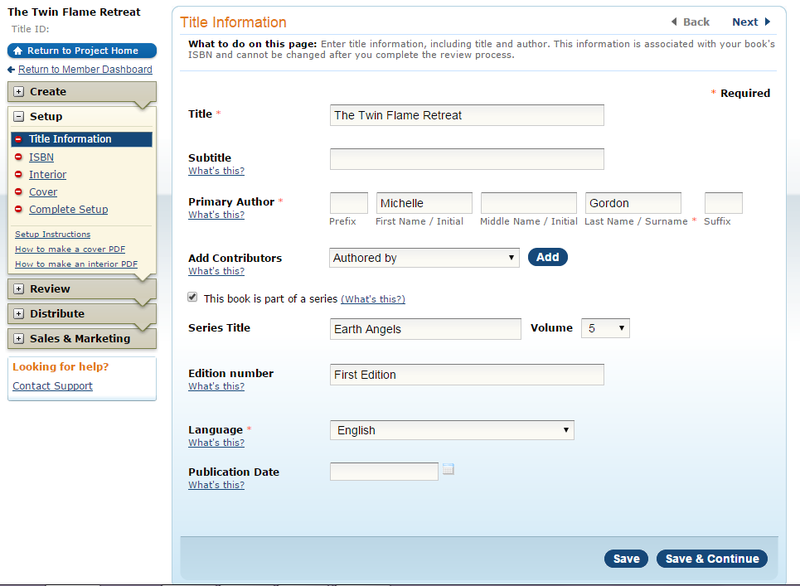 Any footnotes that are in the footer needs to be brought into the text or moved to the back of the book. 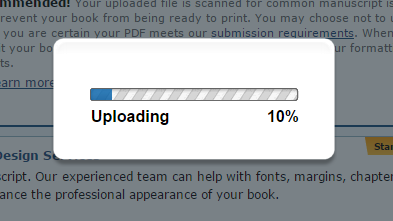 This again, only applies if you are using a file formatted for print. 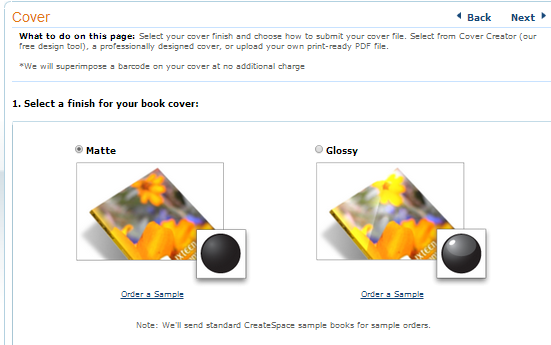 In print books, you will have several blank pages, to ensure that the book is set out properly. 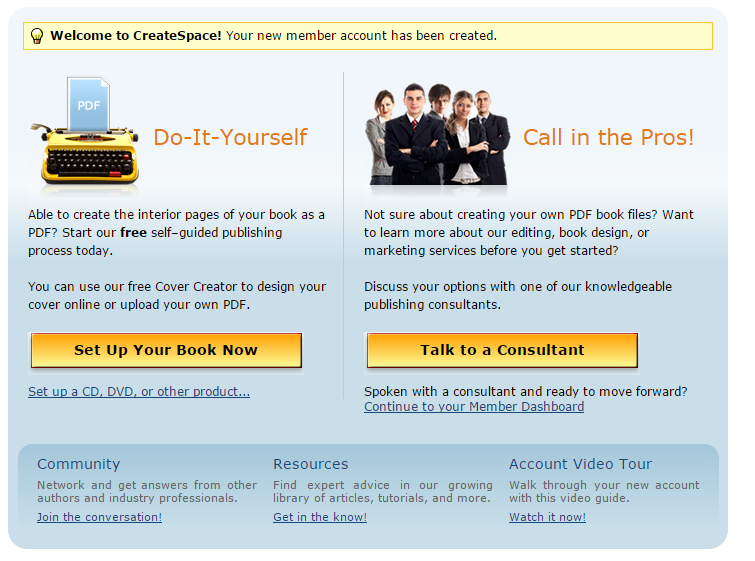 In Kindle books, blank pages are not a good idea. 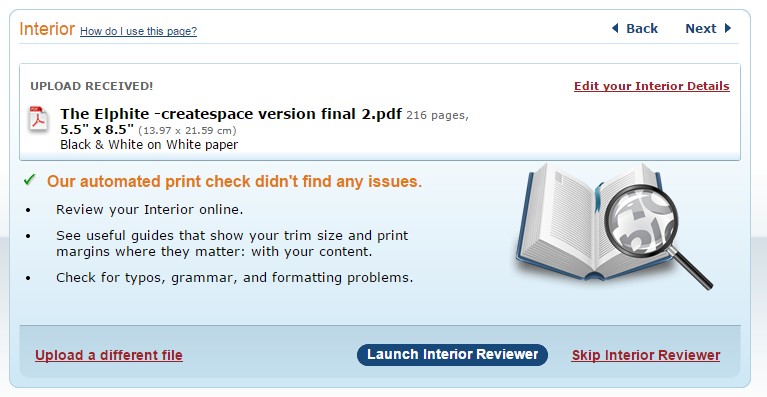 So please remove all blank pages. You can keep page breaks between chapters.